Seen on Facebook this evening... A pretty much fictional paint scheme, but the plastic will be good! 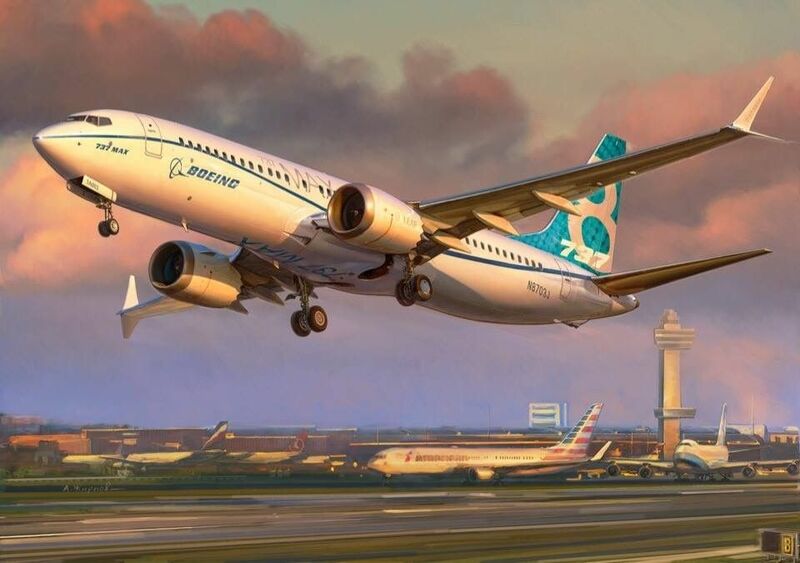 I look very forward to this kit ... how amazing that we will have outstanding kits of every 737 version ever built! excellent!!! I hope Zvezda does the 9MAX as well!! Yeah, I'd forgotten the first aircraft had that bare bones scheme. I think they're making the full blue scheme the standard factory house colors going forward. They showed art of the 777X in the red/orange version seen on the 747-8I prototype, but they will appear in the blue version. And now available on eBay. Some seller has shown a box that appears to contain etched metal fan blades- not sure if this is a special version or they all will have it included. I ordered one from a trusted seller for about the same price as suggested in the UK. Edit- looking again it seems the etched metal and mask set is a special from Armata. Yeah, no extras in Zvezda boxes. Just ordered one for less than US $28 shipped from Lithuania. Hard to beat that. Now hoping on some on some Silkair decals. update - just received mine today from a UK seller who supplied it quicker than my other one that is still slowly winging its way from Lithuania. It's as you would expect from Zvezda, very nicely moulded. It is the standard 737-800 kit (less the engines) with the addition of a frame that makes the -8max. The engine blades are split into two halves, Dreamliner style, to allow the very curved leading edges to be correctly formed. The new parts include a wi-fi blister for the fuselage top, new tail planes and tail cone though oddly the intake lining is two parts unlike the -800 where they were one piece, still not a big problem. Should you choose to use the decals, they're glossy and very nicely printed with a small A5 colour printed painting guide, paints referenced to their own and now Tamiya (not Humbrol on their previous kits). Was just looking at the photos of it on Facebook. They didn't change the APU intake aft of the R2 door, which needs to be done on the MAX. The geometry of the entire aft fuselage, not just the APU exhaust cone itself is different on the MAX. The changed geometry allowed them to eliminate the small vortex generators above the horizontal stabs on the MAX. Zvezda MAX8 sprue photos have just been uploaded to AC, courtesy of Jedrek. Looking at photos of the sprues, I think it is generally a nice job. Most of the noticeable changes to the rear fuselage occur behind the rudder line, with the exception of the APU intake, as Jennings noted. The MAX uses a door which is flush with the APU off and extends into the airflow 17 degrees in flight and 45 degrees on the ground when it is operating. Clearly they were trying to use the -800 fuselage, but the APU inlet can easily be sanded and filled with minimal drama. I also noted that the retractable landing lights on the wing-to-body fairing are still part of the moulding, and should not be present on a late model -800 and all MAX airplanes. The pylon to wing situation on the kit looks good. Here are some photos of the actual aircraft for comparison. As far as I can see from the available photos here in the database Zvezda have used the same nose gear strut from the 737-800. However the 737 MAX 8 nose gear strut is 8 in / 20.32 cm longer. This eguates to 1.41 mm in 1/144 scale. As I have not received my MAX 8 kits to compare it to -800 kit can anyone confirm this ? If I'm correct this might affect the stance of the kit. Yeah, same nose strut. With a small spacer it could be possible to extend the kit part to at least give the correct height. Not a biggy really. Looking at the sprue photos, it's the exact identical sprue from the -800, and I'd be shocked if they changed it. Got my MAX 8 today from Lithuania. As with every other Zvezda 737 I've bought, the tip of the vertical fin on one side was snapped off. Every single one. Also note the lack of a nose gear mounted taxi light. This has also been moved to the wing root "fixed" landing light area using LEDs and reflectors. This configuration is also seen on late model NG airplanes. It still looks strange to me but, boy, do those new lights work! One of my -8max kits has quite badly warped tail fins. Another 737-800 kit had severely warped left outer wing. It's quite a gamble at times buying a Zvezda kit hoping it's not too warped and twisted!! As for asking SAC to provided white metal replacements - I'd pass on that as he/they just copy the kit part. And also the few that I've bought have been so poorly cast they were useless. Probably easier to insert a 1.4mm spacer between the two halves of the nose leg and add a base for the drag strut to sit on. Dan, I see a Max 8 Walkaround from you in our future. Looking at the photos of the 737-8 Max kit on this site, I noticed in the decal placement guide, decals # 43, which I believe would be the tail illumination lights, are shown on the lower surface of the horizontal stabilizers, should be on the upper surface. Thanks Dan! That'll be great. Take your time, no rush. I finally got mine, it�s good, really good! I really hope someone makes good Southwest decals for it!!! That never happens but criticize a lot!!! Check the vendor link on this site. I've used 8ADecs.com for several Southwest 737-800 models. Plan to do the same when I build a Max. Though stripes are provided, I prefer to paint them. A little info regarding the Zvezda 737-MAX8 kit, and what is going on price wise in the U.S. The importer is Stephens International. They have chosen to price it the same as the Zvezda 747-8i kit, even though as we all know it is the same size and weight as the 737-800 kit released last year. They say that Zvezda raised the price.... but if that were true wouldn't overseas retailers also have priced the MAX8 kit close to the price of the 747-8i? Luchtvart Hobby Shop has the two 737 kits at the same price, and Hannants has the MAX8 about $1 more than the 800. The importer is Stephens International. I honestly can't remember the last time I ordered a kit (especially a Zvezda kit) from a retailer in the US. The only exception would be if they were selling on eBay. I simply go to eBay, type in what I'm after, and hit "Price + shipping, lowest to highest" and order from the first one that pops up, regardless of where in the world they are. More often than not that's overseas, and usually the shipping is very reasonable.